God above, before I begin my holy work, healing Your creation [human beings], I lay my plea before You, that You will grant me the strength of spirit and the vast energy to do my work with faith, and that the aspiration to accumulate wealth will not blind my eyes from seeing one who is suffering, one who comes for my [professional] advice, as a human being, [whether] rich or poor, friend or foe, the good and the evil person, in his sorrowful moment reveal to me only the human being in him. My love for the learning of medicine should only strengthen my spirit, only the truth shall be the light before my feet, for any weakness in my work might bring about death and illness to Your creation. I beg you, please, compasionate and gracious God, strengthen and focus my body and my soul and plant within me a spirit that is whole. 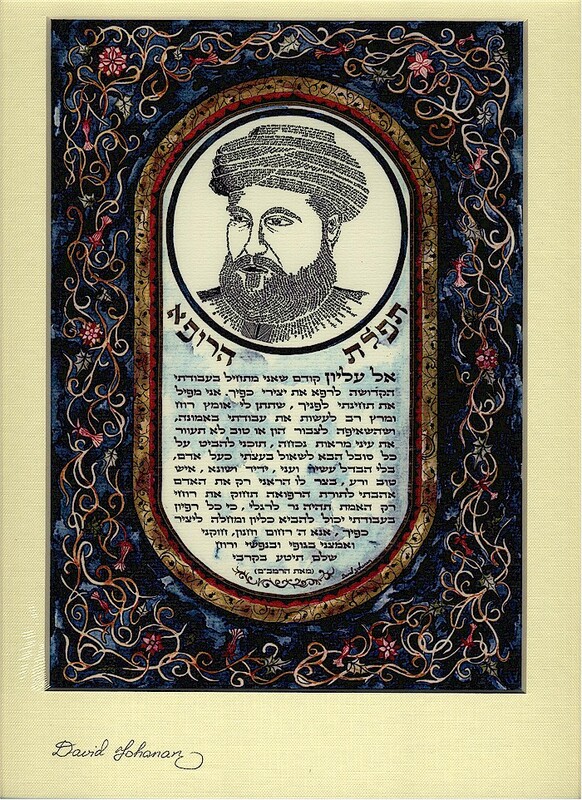 The face in the piece is of the Rambam. The most renowned Jewish physician in the Middle Ages, who was also a distinguished rabbi and philosopher, was Moses Maimonides (the Rambam, 1137-1204). Born in Cordoba, he fled to Fez. Later he went to Palestine and then to Cairo, where he became a physician at the court of Saladin and his sons. 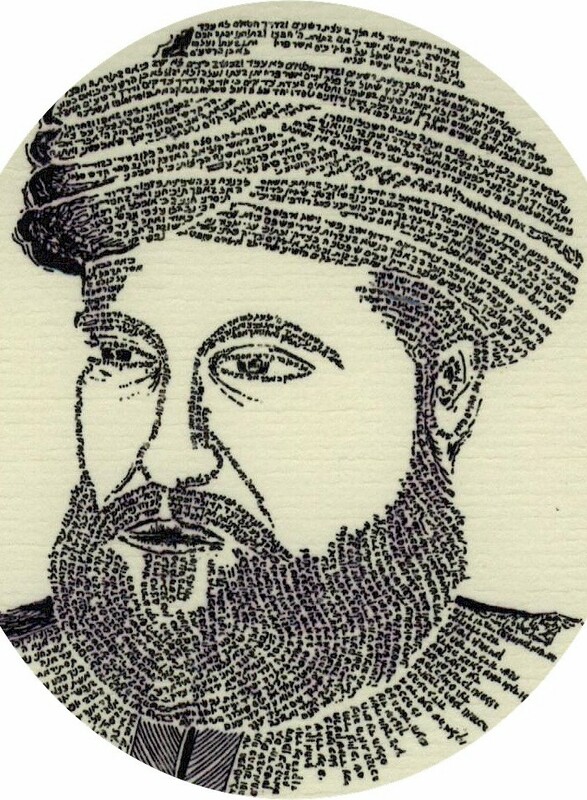 Maimonides had a prodigious literary output, including extensive writing on medical matters. These were written at the end of his life, after his monumental halakhic and philosophical works. Maimonides strongly believed in prophylactic medicine. In his Guide to the Perplexed he wrote: "Among a thousand persons only one dies a natural death: the rest succumb early in life owing to ignorant or irregular behavior." 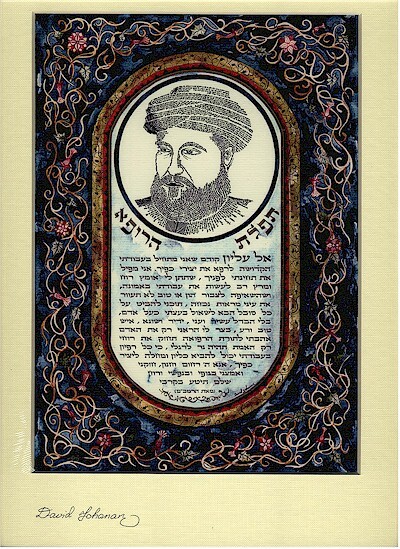 Maimonides considered the study of medicine a very important factor of Jewish ethics. It helps to maintain the fitness of the body and enables [man] to purify and raise his strength to an uplifted ethical plane." This is a wonderful addition to physician's office or as a gift for anyone in the medical field.